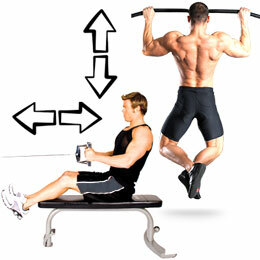 If you are trying to find the best ball exercise or any other types of exercise always keep your fitness goals in mind. It is your goals which should be the primary determinant of your exercise selection, intensity, frequency and duration as well as most other aspects of your fitness program. If you choose exercises which are not goal specific, it will increase the time it takes to achieve your goals. It also may cause you to get so frustrated about not getting the desired result, you will feel like quitting your exercise program altogether. You may want to exercise more, but if you perform the correct exercises, you will achieve better results in your fitness program. It is possible to have an exercise program based entirely on the best ball exercises. The best ball exercises challenge your stabilization. This is the most important advantage of working with exercise balls. Stabilization is important for the entire body. The body parts which stabilization is most important are the core and the shoulders. Without proper core stabilization your body can not perform movements with the highest level of efficiency. Using the best ball exercises to improve your core will help the rest or your body be more stable, efficient and improve your balance. If you use exercise balls, especially for body weight exercises such as push ups it will dramatically improve your shoulder stabilization. 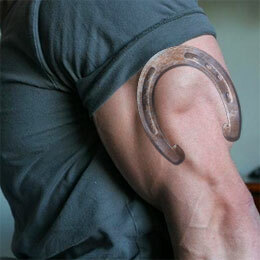 This occurs because all your muscles have to work together to stabilize your shoulders. This includes muscles which are not primary movers. For example if you perform a machine chest press, everything is stable so only your primary muscles involved in the action are trained (chest, triceps.) If you perform a stability ball push-up, which is an unstable environment your body has to use all the extra muscles which help stabilize you so you don’t fall off of the ball or tremble. Another very important aspect of improved shoulder stability is the reduction in the possibility of shoulder pain or injuries due to exercise. Shoulder pain is very hard to work around. It can even stop you from performing leg exercises. Which are the Overall Best Ball Exercises ? 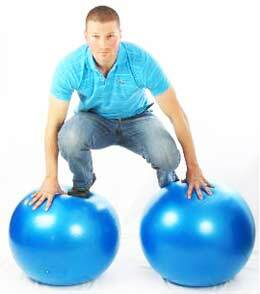 These exercises are the best because it either very difficult or impossible to duplicate them using anything other than the different exercise balls which they use. Remember, all exercises are goal specific. If you are not ready to use an exercise ball, these exercises will not be the best for you. The physio ball plank especially the dynamic version is the most intense body weight core exercise. Proper form is necessary, if you experience pain in your lower back, stop immediately and do an easier exercise. Position yourself right on the top of the stability ball. Put your forearms on the ball and make you have as much surface area on the ball as possible (elbows to fists.) Hold the plank position. To increase the difficulty all you have to do is push your elbows forward a very small distance. This exercise is so simple you may not believe it is one of the best ball exercises, that is until you do a set. 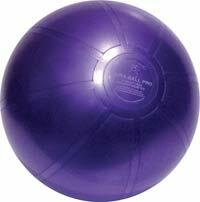 Another method of increasing the difficulty of this best ball exercise is to lift a foot off of the ground. To make it extra hard you could abduct your foot out to the side. If you did so with ankle weights on, it would be yet another progression. 2 arm medicine ball push-ups are a tremendous workout for your triceps but also work your chest and anterior deltoids. To start, put both your hands on the medicine ball. If you have your palms towards each other you will get a better grip on the medicine ball. Drop your chest all the way down until it touches the medicine ball and push back up. Keep your head up and repeat. If you can do 20 reps on your first try, give yourself a pat on the back. 1 arm medicine ball push-ups primarily work your chest and shoulder stabilizers as well as your core. Start with your arms spread out to your normal to wide push up stance. Put one hand on the medicine ball and the other on the floor. Keep your head up and lower your chest toward the floor. Once you complete the push-up roll the medicine ball to your other hand. Try to keep your hips level and of course do not let your knees touch the floor. If you can perform 20 reps on the first try that is very impressive. Remember, again proper form is of utmost importance when performing any of the best ball exercises. This may be the most challenging best ball exercise. It is actually a combination of many exercises. You will work your chest, triceps, core, obliques, shoulders, quads, hamstrings and glutes, not to mention your cardiovascular system. It is best if you start in a hallway where you have at least 30 feet of space to walk. If you do not have space to walk forward, you can also perform standing in place. Pick up the BOSU ball and turn the blue part away from you! Start by having the BOSU at your chest, lunge forward all the way so your knee is directly above your ankle. Your back knee should be 1 inch off of the ground. Extend your arms in front of you, and twist the ball over your forward leg. Bring the ball back to the middle, set it on the ground next to your foot. Bring your front foot all the way back and keep it in the air. Perform a push-up touching your chest to the BOSU. After you perform the push-up, bring the foot which is still in the air all the way back forward. Keep your back knee down and do a full 1 legged lunge back up to the original position and repeat. If you do this properly for 12 reps you may be ready to progress. You can add stationary lunges, push-ups and twists to your delight if you wish to make the best ball exercises even more difficult. The best stability ball exercises for every major muscle group. Use these exercises to supplement your workout program. Learn how more stability equals better results in strength, performance and body composition goals. Two workouts. One for if you want to have a workout with just a stability ball. Another stability ball workout for those of you who have a gym membership and would like to incorporate the physio ball for the majority of your workout. Here are some of the best ball exercises using both sides of the BOSU ball. Use these exercises whether you have used the BOSU ball before or are a beginner. A good BOSU ball exercise idea would be to superset BOSU exercises in between your current weight training exercises. This would increase total workout volume and hopefully help you achieve results faster. You can get a complete, full body workout with just the BOSU ball. The BOSU ball can be used in your own home as well as the gym. One workout consists of exercises with just you and the BOSU ball. The other workout uses all the tricks of the trade along with the BOSU to create new challenges to make your workout not only more challenging, but fun.